And immediately recognizing what we are dealing with and its actual antecedents throughout history is what I am once again grateful for this day before Thanksgiving. Because as outlandish and unexpected as some of what I write about may initially be to you, it is true and I can prove it. If I had not pulled all of these facts together, 2014 would be the year in which so many political and social institutions and their leaders globally decided to go for broke. With our lives, children, future, and tax money. And no one on the outside of these schemes without a lucrative grant or rich employment contract would know how all these pieces fit. Before I let the remainder of the post be the popular philosophical essay from last year, let me add a few updates that I am thankful for. 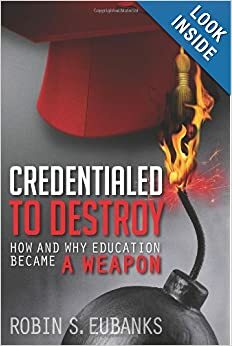 I am thankful my book Credentialed to Destroy: How and Why Education Became a Weapon is now available on Amazon and for kindle and that I let it simmer on a shelf for more than a year while as I started this blog. The events that left me so alarmed and the unexpected intensity of the psychological focus of the real implementation helped me properly frame what I was dealing with when I went back early last summer. Those of you waiting for the sequel or for me to tell the story through the blog will need the foundation I lay out in the book to appreciate what the blog encounters weekly and what I now know but have not written up yet. Another thing I am immensely grateful for is the unbelievably confessional nature of certain used books I have obtained in the last year. And that various people had the wisdom to get those still relevant plans and intentions off of library shelves but left them still available for sale for an enterprising, not so young, lawyer trying to piece together the why of what she had located. I hope each of you get much of what you cherish over the next few days and avoids as much as possible that which drives you crazy. No, please do not take that as an indication I will try to hide from any of my children. I can’t anyway. I am cooking the main meal. One more update to the previous post. I can promise that together we will be able to piece together and properly interpret every machination and theory and intended policy change anybody comes up with in 2014. Game on, ears open, eyes observant, and mind fully engaged. Typing still hunt and peck but speedier. Here we go….. I did not take you through excruciating details on what has been sought since at least the 60s to fill you with a sense of woe but to ground present known intentions in their proper foundations. This is not just some pursuit hatched by the current occupant of the White House and his friends nor is it limited to the US. It has been a long term scheme for political, economic, and social power. It seeks to shift decision-making away from individuals and vests it in the public sector or with vetted cronies and in international entities like UN agencies and the OECD. But it is such a high priority of this administration that President Obama signed an Executive Order on his very first day in office stipulating that all government information that did not have to be kept secret for security or privacy reasons should be made public. This new policy is called the Open Data Initiative. Its importance to governments globally can be seen by the G-8 Summit in June 2013 adopting an Open Data Charter. Now people from time to time will ask me if I could please limit my posts or my new book Credentialed to Destroy: How and Why Education Became a Weapon to discussions of education because that’s all that really interests them. My answer has always been no as the documents are quite clear that all these education reforms being pushed in the US as the Common Core or globally under names such as 21st Century Skills, Personalized Learning, and Positive Behavior Systems are simply means to certain ends. I think not discussing the sought ends leaves the reasons on why the actual implementation looks so much like social engineering impossible for us to grasp. We do not have to wonder anymore why anyone would do what we can now prove they [Who is ‘they’ many people ask? foundations, ed professors, district supers, and too many school principals will do for starters] are doing and mandating with every bit of legal authority they can seize. In October 2013 McKinsey Global Institute issued a report laying out the intentions of our governmental overlords in 7 ‘domains’: education, transportation, consumer products, electricity, oil and gas, healthcare, and consumer finance. Basically learner analytics will be applied in the future to the Open Data and business and individual proprietary data to supposedly “enable better decision-making.” But not by us anymore. Think of this as the idea that the Service State we encountered in the last post or the planned society we encountered in the post before that are now achievable in the 21st century via supercomputers, models, and Big Data. The report is called “Open data: Unlocking innovation and performance with liquid information.” McKinsey uses the terms ‘open data’ and ‘liquid information’ synonymously. Before we get to the open acknowledgment that the new tech-enabled personalized learning being pushed as an essential aspect of global education reforms is actually intended to “increase motivation [remember our conation discussion and that nerdy phrase triune consciousness? ], change mindsets, and adjust learning strategies,” let me go through some of the troubling assumptions from other domains. How about the assumption that “conceivably, credit card companies could raise interest rates on households that waste electricity”? Does that sound like the credit card companies now are independent or an arm of governmental policy for desired future behavior? How about businesses now subject to “open data released by third parties could expose poor environmental or labor practices or show their products or services compare poorly for price and quality”? Isn’t that ‘a run your companies in the manner we desire or you will get bad publicity’ threat? The proprietary data will be gone. Governments as usual will be lousy administrators with no real incentives to do a good job. And from looking just at the education component, the benefits appear to me to be illusory but the levers of manipulation over human behavior look boundless. All in all the kind of stupid ideas that would be resisted at every turn if only they were better understood. And without so many advocates with their hand in the cookie jar of intended future governmental spending. All this ed data being gathered is said to improve individual “performance, which can lead to higher graduation rates, greater educational attainment, and increased lifetime earnings.” Not if students do not know much of anything and everyone suddenly has the same credentials. The personal data being gathered then is extensive and real and just full of non-cognitive information. And the tasks and activities the student is asked to do get adjusted as necessary to gain success. Not exactly the ingredients that would actually foster future economic success. Von Mises was simply discussing the overall impact due to the disincentives to be productive in the future. Given the contemplated mind arson I have been documenting, just imagine the actual effects of disincentives to be productive when coupled to the widespread inability to be productive. And then add on the cost of the public sector to poorly administer this planned society. And all that insecure Open Data. And the wasteful cronyism attached to the planned collaboration. And the lack of personal freedom. The Open Data Initiative surely will lead to a society incapable of mass prosperity. Makes you wonder who they think will fund the redemption of all those Social Security IOUs in the near future under these plans. I guess it’s a good thing all the administrators and politicians pushing these plans intend to rely on taxpayer-financed pensions to fund their retirements after careers spent destroying the source of wealth everyone is taking for granted. Will this really work out well for anyone in the long term? Back in the 1960s during the era of both the Cold War and the Vietnam War and thus dramatically different circumstances, we still find the foundations of the sought social, political, and economic changes being imposed through education “reforms” now. Off our collective radar screens but no longer off mine, we can find the reports of the Carnegie-funded Commission on the Year 2000. It sought to shift the US away from “hackneyed notions about decaying capitalism or creeping socialism” so that the US could transition to a “national society committed to some form of directed social change.” And none of us were consulted about who would be steering that wheel or holding the compass and issuing directions. I guess we can assume though Carnegie officials believed they had ringside seats from financing the plans. Systems Thinking creator Kenneth Boulding’s writing about the Great Transition and what was needed to achieve it from the last post was cited by Commission members. Just like Lester Milbrath in the 1980s and UNESCO and the OECD now, there was a call for “some sort of computing and planning agency outside the legislative process” that would be in charge of “weighing of interrelationships within the society and within the technological processes.” In fact, Harvard psych prof George A. Miller wrote of “large, centralized, integrated data bases in the social sciences. Without them, the planners in the year 2000 will be scarcely better off than we are today.” Gulp. Gulp. Harvard was not alone in being the Cambridge representative on this push. Perhaps getting ready for all its Limits to Growth social systems computer modelling work and urban planning and Peter Senge’s version of systems thinking, MIT Neuroscience prof Gardner Quarton wrote that “one can safely predict that techniques for controlling behavior and modifying personality will grow more efficient by the year 2000.” Maybe this post should come with a warning about reading on an empty stomach. But I want to put the shocking shifts in the nature of what is now being imposed on classrooms and what must be shunned to avoid teacher demerits, if not downright dismissal, within the context of what is REALLY being sought. The SRI Rethinking Education link from the last post and the related “Naturalizing Assessment” article need to be seen through the Lens of the declared social science aims. That’s why we find statements about how “the conception of knowledge shifts from ‘in the head’ facts, procedures, and professed attitudes, to participants’ abilities to participate meaningfully in valued activities while bringing to bear personal, material and social resources.” In other words just showing up and being ‘engaged’ will do. This shift in the classroom is not a dispute about how students best learn. It is about what kind of education can best propel the sought sociocultural shift. And to do it at the level of the student’s mind and personality.That emphasis will alter the future even if the actual consequences are not as planned. It’s also how you “manipulate the public” as the Commission admitted it sought to do. As SRI has sought to do as well over the decades. Interdependence, holistic thinking, and a systems approach were touted as a means to “unify now separate social sciences” to reframe “what we believe, value, and aspire to” so we will have a different political philosophy impacting the “choices and decisions that guide our individual and group living.” If all of this was about a new planned social order in 1965, the same ideas and intentions remain about that in 2013. Even if those pushing these ideas have never heard of the Commission on the Year 2000. And all of this gets accomplished now by (quoting SRI in 2010 again) “adjusting one’s conception of knowledge or the nature of valued outcomes” as well as the nature of “participant assessment.” And as SRI put it, to accomplish the sought Mindset and personality changes “these shifts need to occur in tandem.” All these think tanks like SRI, Rand, Gorbis’ Institute for the Future, or Willis Harman’s Institute for the Noetic Sciences are all fascinated by a hoped-for ability for the “intervention of man into the evolutionary process.” Yet such manipulation is the lied about and hidden push by a self-appointed elite over masses of people just trying to make their lives work and erroneously assuming K-12 schooling remains about the transmission of knowledge. Education in 2013 has become all about imposing such social science theories on real people and schools and then seeing what happens. Only a background devoid of solid knowledge or polluted by a desire for radical change or driven by acute greed could fail to see we have a disastrous future building up if these plans continue their march toward full implementation.